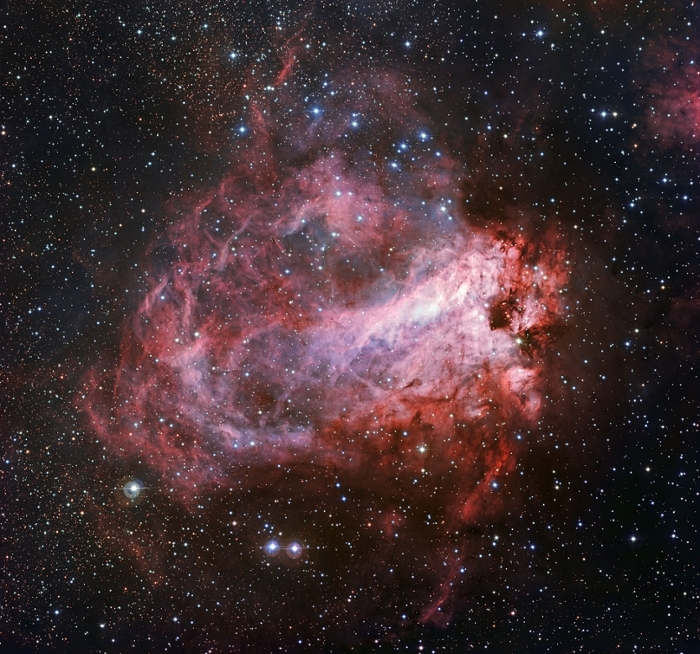 You may know the Messier 17 nebula as the Swan or Lobster or even the Rose nebula. Whatever you call it, you better buckle up because the European Southern Observatory is about to fly you through the beautiful stellar nursery. The Messier 17 nebula is located about 5,500 light-years from Earth near the galactic plane of the Milky Way and in the constellation of Sagittarius (the Archer). It spans a big section of the sky — with gas and dust clouds that measure about 15 light-years across. The nebula appears as a complex red structure with some graduation to pink, a signature of glowing hydrogen gas. 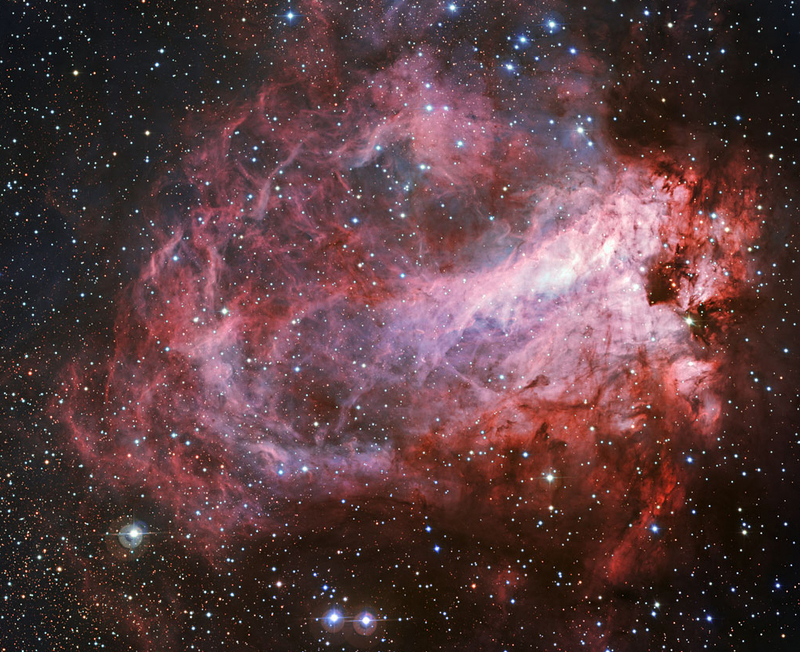 Throughout this rosy glow, the nebula shows a web of darker regions of dust that obscure the light. Though these areas are dark in this visible-light image, they also look bright when observed using infrared cameras. The gas in the nebula is estimated to have more than 30,000 times the mass of the sun. Messier 17 also contains an open star cluster of 35 stars, which is known as NGC 6618. The total number of stars in the nebula, however, is much higher — almost 800 stars in the center with even more forming in its outer regions. The short-lived blue stars that recently formed in Messier 17 emit enough ultraviolet light to heat up surrounding gas to the extent that it begins to glow brightly. In the central region the colors are lighter, and some parts appear white as a result of mixing the light from the hottest gas with the starlight reflected by dust. The nebula owes its official name to the French comet hunter Charles Messier, who included the nebula as the seventeenth object in his famous astronomical catalog in 1764. It has had more names bestowed upon it over the ages than any other object of its kind: the Omega Nebula, the Swan Nebula, the Checkmark Nebula, the Horseshoe Nebula and — lest those with more of a more marine bent miss out — the Lobster Nebula. But even with a name as bland as Messier 17, this flowery nebula still looks dazzling. Smelling the rose. This video sequence takes us from a broad vista of the bright central parts of the Milky Way into a close-up view of the bright star formation region Messier 17. The final detailed view is from the MPG/ESO 2.2-meter telescope at ESO’s La Silla Observatory in Chile. Courtesy ESO; N. Risinger.